American market Subarus have two separate lighting circuits. 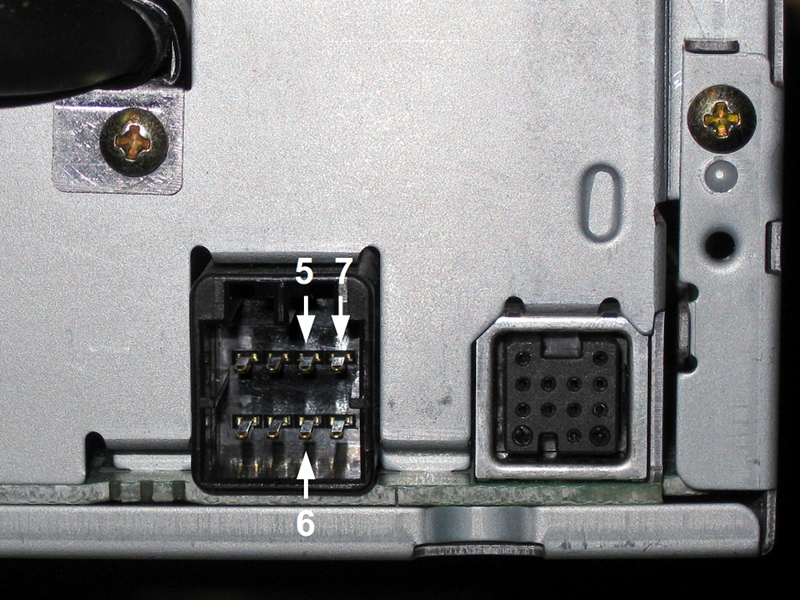 I’m not sure why this is, however to get the backlights working on a right-hand drive Legacy you need to connect the Illum- pin on the rear connector permanently to ground. The best way to do this is open the unit and solder a small wire directly from this pin (marked on the PCB) to the nearest ground point. Having said that some JDM Legacys already have this pin connected to ground so best to check your car first. As this is for the American market the FM and AM tuners work in 200kHz and 10kHz steps respectively. In NZ we use 100kHz and 9kHz steps instead. As the frequency range is the same there is no modification required to the tuner, instead we simply resolder a couple of jumpers near the microprocessor to change the area from 1 to 2. To open the unit up, unclip the front panel first. 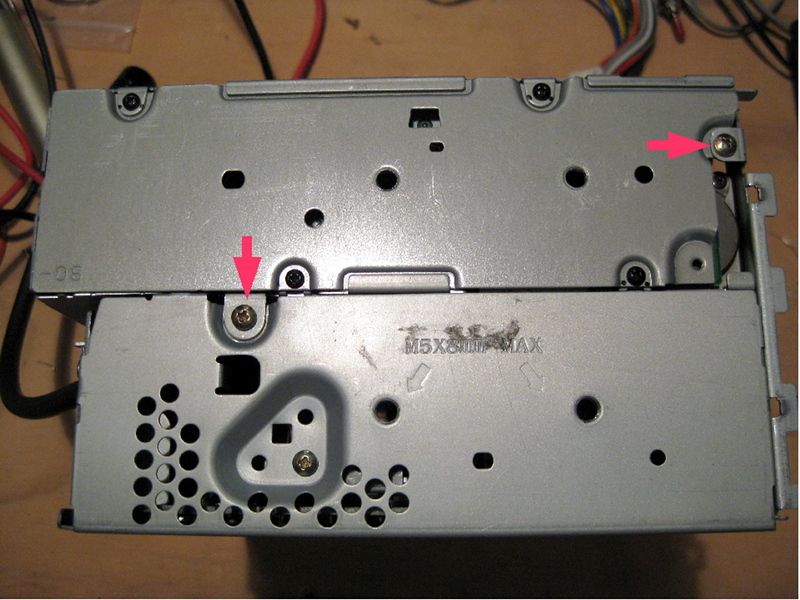 Remove the screws as marked in the photos below and lift the CD changer mechanism off. 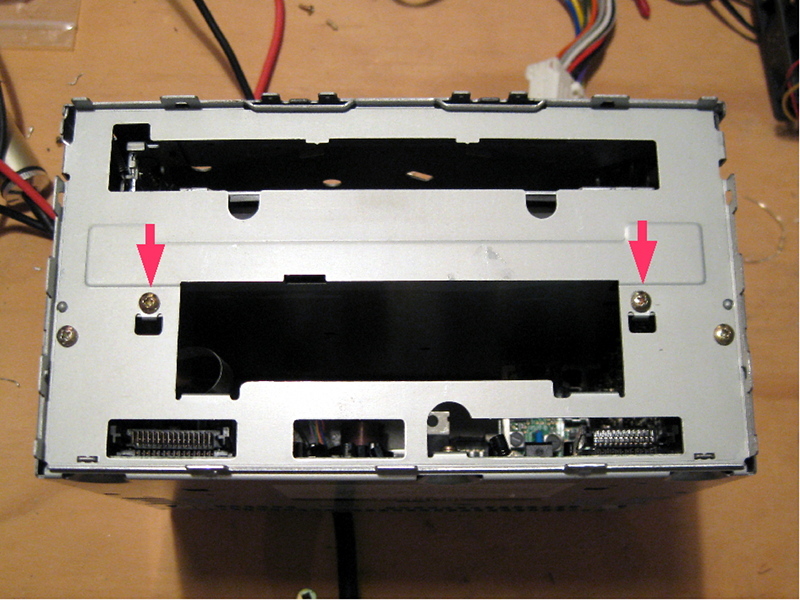 Be careful not to damage the ribbon cable; this can be properly disconnected by carefully pulling it out of either connector. 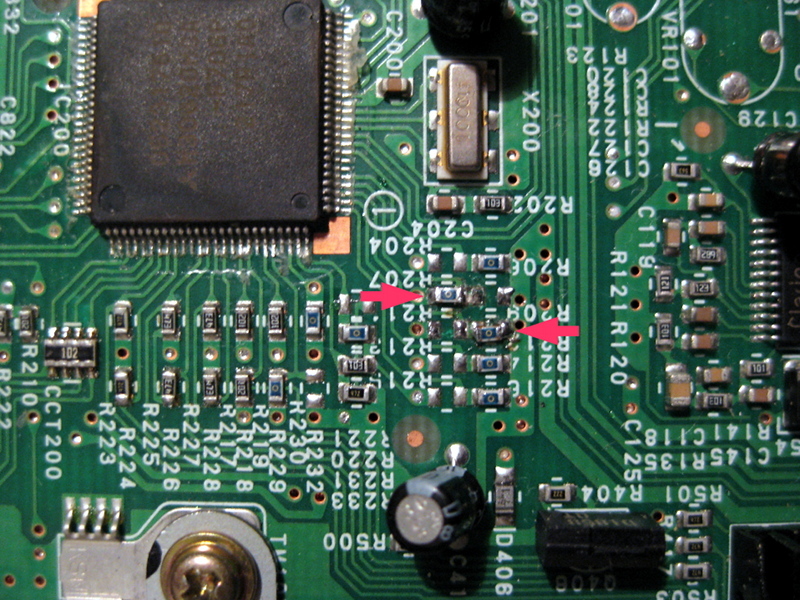 On the front right-hand side of the main PCB are a series of 0 Ohm resistors. Move R209 and R211 to R207 and R212 respectively as shown in the photo below. Area selection jumpers after changing to area 2. Sorry about the messy soldering! Reassemble the unit and test it. Note that changing the area disables the weather band function so the W.B button on the front panel will no longer do anything. Whilst this unit does not officially have an auxiliary input, you can make one pretty easily. On the rear panel there is a connector for a car phone. Short pin 5 to ground (or pin6) to enable phone mode. The display will show CALL and you can feed mono audio into pin 7. The unit will stay in call mode until pin 5 is released. The big drawback to this approach is that it bypasses the tone controls. If you don’t mind that then this method works quite well. For stereo sound input, remove R857 and R858. 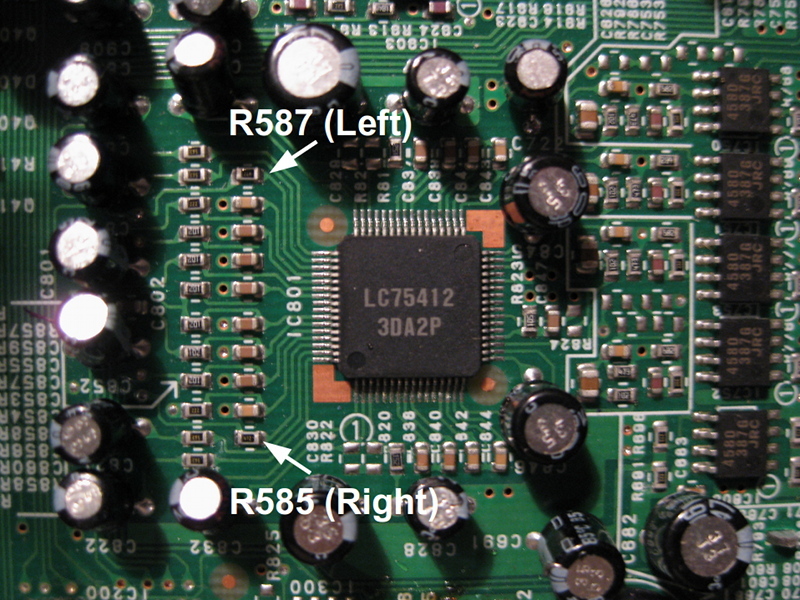 Connect an input with left to R857 and right to R858 using the solder pads closest to IC801. I strongly recommend connecting a 10μF or so bypass capacitor in series with each input. How you connect your device (e.g. iPod) is totally up to you; for example you could mount RCA jacks on the rear panel or run a flying lead with a 3.5mm jack. To improve the sound a bit I reduced the frequency of the bass control from the original setting of 100Hz to about 65Hz. The tone control is performed by IC801, a Sanyo LC75412WH. To do this, solder additional 100nF capacitors in parallel with C837 to C840. Alternatively you can replace them entirely with 220nF capacitors which will reduce the frequency to about 60Hz. If you want a different frequency the formula to calculate suitable capacitors is shown below (taken from the LC75412WH datasheet). Like all McIntosh head units, the PF-2520I is compatible with the Clarion EA-1251 iPod adapter if you want to be able to control your iPod or iPhone from the head unit. These adapters work very well, are easy to set up (just plug it in) and the sound quality is excellent. To switch to iPod, simply push the Disc button until CHR 1 appears on the display. You can then control the iPod like a CD changer, using the track controls. You can create playlists on the iPod called clarion1 through clarion5. Switching to disc 1 plays all songs on the iPod, and discs 2 to 6 play playlists clarion1 to clarion5 respectively. Unfortunately these older McIntosh units lack two desirable features for iPod support; they do not display song title information and there is no random/shuffle button. I’ve also had quite good luck with Anycar Link units. Yatour make an adapter too but it’s not quite as good. This stereo is designed to operate with the McIntosh EF-1080I power amplifier. It does not have an internal power amplifier so cannot drive speakers directly. I discovered a strange hidden feature on these head units. Turn the ignition to ACC and ensure the unit is off. Hold 1 and 6 and press Bass/Treb. My stereo displays 100 01 which I can only assume is a firmware version or similar. Turn the volume control one click to enable the display test which will illuminate all elements on the VFD. Use the tune knob switch this to every second element and then to button test mode (display will go blank). Pressing any button on the unit should display that button’s name on the screen. To exit this mode, switch the ignition off. Yes, I have the service manual for this unit! Click below to download it. Great read. Do you still have this? I wondered if you could answer some more questions for me. Man this is an awesome blog. Very informative. I’m wondering where you got the service manual for the PF-2520I-A? My Legacy has the premium Mcintosh system which uses the PF-40621 Head unit and i cant for the life of me find a manual. The reason i ask is that A) i have installed a steering wheel with audio controls in my car and am trying to find the input pins to the head unit, and B) i would like to do your FM hack for using it here in NZ. The service manual just turned up after a lot of late nights scouring around service manual sites. I can’t find any documentation on the PF-4062I (that’s the letter I, not a one) and I imagine it would all be in Japanese if it did exist. I have a manual for the PF-2551I series which is similar to the PF-4062I but has a 6 disc changer instead on the MD player. The older MD players can’t be converted but seeing yours is newer and that Clarion seemed to base the various models around a similar platform it just might be possible with yours. Also want to use European FM band and an AUX in. Any suggestions? Perfect timing, I just helped someone with that last week and I have just bought one myself. Good news is that they are very easy to mod as you only need to tweak some coils. I’ll get a post online in a week or so. Wicked blog and thanks for all these good hacks! Certainly and I’ve made it work too, however I’m just too busy at the moment to get all the details written up. I’ll see what notes I can dig up when I get a moment. Please let me know if you are interested in selling this head unit. i have just got my hands on this great piece.unfortunatly it has some issues. are you interested in looking at it. I just got one of these iPod/Aux input units that plugs into the CeNet conncetor. I get power to the iPod but when I push the “disk” button, I never see CHR come up on the display and only hear the disk playing. Do you think I need to short a pin to ground or remove the CDs from the player or would there be another problem? I’ve never used one of those knock-off units but unfortunately it sounds like it’s either faulty or not compatible with your radio. Thanks for the feedback! I’ll see what I can do about the pinout too. I’m not sure about the climate hack; I did one on a BH5 and posted details in a forum once but it won’t apply to a BP5. I need the wrie instruction. And need to know that this model has steering wheel control. I love to install it to my camry 2010. This is the first Mcintosh unit i have and love to have it work. My compliments also for your sterling blogs. I have a Subaru Legacy 2006 with the McIntosh Stereo, without the steering wheel controls. I am presuming it to be the PF-2551I-A but I suppose it could be the PF-2551I-B version (Car reg 4 May 2006) or indeed yet another one…. I can’t even confirm it has the CE-NET socket yet. The amp model is the EF-1208l, this is easier to get at, it has the 20 pin DIN plug holes. Is there scope to connect stuff to this setup, as you have done for the PF-2520I-A? I found the service manuals (surprisingly) on line as you have done, it seems these have the CE-NET connector pre-requisite you mention. Do you know anything about these later stereos? Any help would be appreciated. Be great to get an ipod into this and maybe a BT….. I’ve considered all sort of scenarios such as taking the headunit out, butchering out the gut of the unit and inserting a later single DIN with all the tricks, however the macintosh setup does what it does very well and that would be a shame…. With respect to your CE-NET blog I checked out some data on some IC’s the CA0008AM seems to be a PTC protection device which makes sense for protecting the power circuits from rogue connections. The LC75412WH is an electronic switching unit, its pins 49,50,63 and 64 connect to the CE-NET and are said to be differential input pins, not sure what they are but it might mean the inputs are not referenced to earth? The other interesting thing I note is the input switching IC has a pair of unused inputs (pins 51 and 62 – for “MD -TEL”) whether one can hook up a stereo input to these pins and switch to these inputs I have no idea…. The spec sheet also talks briefly (for me anyway) about switching control via 52 bits of serial data. Anyway perhaps that mutually helps? btw what City are you in nzlamb? Are you on the mythtv mailing list? Email me off net if you wish nzlamb. Hey nzlamb, really helpful stuff here!! The first half the way 🙂 Now if you turn the radio range is already a European … It remains the most interesting … remake tuner. – If you look at the back of the unit, we will see a lot of on-board tuner coils and other detalyushek Lilliputian size. As it is not terrible, but some of them we will have to unsolder and subject to modification. Please do not need a low-power (preferably at 220, and with a step-down transformer) soldering iron with a fine tip, a magnifying glass and a good source of light. – So, we put the device flat, main board down. We look at it from the rear. Upright on board tuner we are interested in three coils. They are strictly on a vertical axis passing through the center of the board tuner. The first coil on top – odnoobmotochnaya. This oscillator circuit coil. Under it a trimmer toli toli trimmer – we are not interested in it. More below double-wound coil – it interstage transformer with tunable LC-circuit in one of its windings. Even lower is frameless coil input tunable RF circuit FM tuner. – Put a muzzle device in place and turn on him. In tuner mode are connecting a voltmeter to the 15th pin terminal tuner marked VT. According to it, the tuner signal adjustment circuit with circuit frequency synthesizer. Regardless of the frequency of this output will be about 7 volts. Although when all is well, there must be a minimum of 2.1 (87.5 MHz) to 6 V (108 MHz). But we are switched to another synthesizer mode and oscillator still works in the old format and can not be reconstructed. Accordingly, a frequency synthesizer provides the maximum possible control signal to the LC-circuit varicap tuner. To oscillator circuit can be reconstructed at a higher frequency, it is necessary to reduce the inductance of the coil. Unsolder it. It turns 4.5. Wind off one or two turns (do not cut off the excess wire!) And solder the coil on the back of the board. So convenient to adjust. To expose the tuner frequency of 87.50 MHz and control the voltage at the VT. Should be 2.1 V. If close, you can try to twist otvertochkoy miniature ferrite rod in coil and adjust the voltage to 2.1 V. If the voltage is always more than you need, it is necessary to further reduce the number of turns in the coil. If the voltage at the VT noticeably smaller 2.1 volt, then you need to overdo it and turn back into place. I have the grace came when I removed about half turn (unfortunately tuning inductors with ferrite core has a very small range of adjustment). When you tune in to the very same 2.1 V, then try to go to 108 MHz. At the point of VT should be about 6 volts. I had a little less nice, but IMHO it is not a crime. Now we can finally cut the excess wire and solder the coil in its place. Radio should already play. Bad, but it should! – It is necessary to reconfigure the input LC-circuit. Fed to the corresponding coil and remove one turn. Soldered back. The reception quality is now to be much higher. Shifting / pushing the turns can change the setting of the contour and thus the quality of reception. In fact the input circuit is a bandpass filter with all the reasons and consequences. -Next. Manually tune in a station with the naiotvratitelneyshim reception. And begin to turn the double-wound ferrite rod coil. According to the ideology of the reception should be improved with a decrease in the influence of the ferrite coil. Yes there seems, in practice, the way it is! I have the best result was achieved with a completely wrung out of the coil core. The experience with the removal of a single turn coil on which a LC-circuit was not very successful. Inductance of the coil was too small, and even a ferrite rod is not able to raise it to the required level. While this may be a feature of a particular instance, and no more. In any case, I will describe how and what to do. In this case, we are interested in is the winding, which is connected to the motherboard with two outputs varicap (This three-legged SMD-scutes on the back of the card). Mine is a top winding the coil and its findings have been soldered to the board of the local oscillator coils. Fed to the coil and wind off one turn with said winding. Then solder it back and donastraivaem ferrite rod. … listen to the radio in the usual range. Yeah it will, I’ve modded one and others like it using the same method and they work great. I’ve just never found time to post it unfortunately. I can follow a guide if its clear and I understand it, otherwise can you do these mods for a fee? I have a 2003 Outback with the PF-25201 HU. It’s stuck on 107.9 with full volume. Seem to be a common problem. Can it be fixed or should I just buy a new HU? Sounds like a relatively easy fix. I’d check the 8v supply rail first. Also might pay to reseat the front panel and check the solder joints on the front panel connectors in case they are not making reliable contact. nzlamb, thanks for the information. I reviewed the schematic. I don’t see the actual source of the 8v supply. Are you referring to the VFD+8? How do I identify the supply rail and when I do, what am I looking for that might be the cause? Just picked up a USDM McIntosh PF-2520I-B on Ebay which looks absolutely identical. Don’t know what the ‘B’ designation means compared to the ‘A’ – uanble to find a reference anywhere on Google. Should just drop into my 2002 H6 Outback VDC (where I also just replaced all the door speakers due to foam rot). I have an OEM McIntosh Head unit, 6-disc changer, that has a CD transport seize-up. I have sent it to United Radio in Syracuse, NY but they told me they can’t repair it because they can’t get parts for it. Anyone have any insight on this? The unit sounds GREAT and I have recently replaced the front speakers (not a small investment). Thanks folks! I’ve bought a parts for this head unit from there before including the drive unit (laser and spindle motor) – very happy with the service. As always, your blog is a goldmine of good information! I do have a couple of questions for you: have you ever found a source for the 20-pin connectors used on the PF-4062i? I’ve tried searching element 14 but come up blank. Also I’ve been thinking about the alternator whine/hum/buzz that people have been experiencing when using an aftermarket head unit with the mcintosh amp. Being a balanced amp you need to earth the -ve input. It seems most people are connecting -ve to earth at the head unit end, leaving the entire length of cable to the amp to pick up noise. I wonder if earthing the -ve input pins at the amp end would eliminate the noise? Good point David, I’ve updated the post to suit. I haven’t found a source of the 20 pin connectors though unfortunately, although I’ve heard that RS might sell them. I’ll post something if I find a source. Hey there, just did your tuner conversion, thanks! Hi nzlamb, so I have the PF-2520i that came from US spec Legacy which I am currently retrofitting in a Miata NA. Can you clarify how exactly could I add an auxillary input for a phone? I also did get the ef-1080-d which brings me to ask what the difference between the ef-1080-i is? I can’t seem to find any data on the wiring diagram for it. I did get the pig tails for both units and the 13 DIN cable. Also would I be able to retrofit an longer 13 DIN cable so I can mount the amp in the trunk? Would I be able to directly connect an amplified Pioneer TS-WX50 (spare tire sub) to the ef-1080 or would I be be serve if I get non-powered sub system as the ef-1080 is a 5 channel amp? Thanks in advance. Sorry for the late replies on this – I get so much comment spam these days I end up losing track of a lot of messages. See my previous reply – hook the Pioneer sub up to the output of the McIntosh EF-1080I amp. Just make sure there is a speaker-level input on the Pioneer, otherwise buy a level converter (attenuator) instead. Don’t hook the McIntosh output directly into the RCA line inputs on the Pioneer or you will damage it. There are several minor revisions of the EF-1080I amplifier (A through D). There is no significant difference between them. The only thing to watch is that there are versions of the EF-1080I tuned for Legacy sedans and wagons as the interiors and speaker layouts are different. The only practical difference I have been able to identify is that the sedan version has a lower sub gain but this is easy to change on either version. Sedan amps have a green power connector, wagon ones are white. It doesn’t matter which you have as you will be able to compensate for the gain difference on your Pioneer sub anyway. Hi I have this exact head unit that I am currently retrofitting to a 1994 Miata. Can you please clarify how I can do the “auxiliary input” so I can have a phone input? I’m not quite understanding what needs to be done, also this not a bluetooth connection is it? I also have the EF-1080i. From what I gathered this a 5 channel amp (I have all the wirings for both units). So can I connect a powered sub to it? Or would a none powered sub be ideal? Thank you in advance. Personally I wouldn’t bother with the phone input for aux these days – get a third-party CE-Net adapter like an Anycar Link or a Yatour instead. I personally use the Anycar and it does the job quite well. The amp is five channel – the sub crossover and such is built into the amp and it derives the sub channel from the four inputs. If you want to connect a sub, either connect a non-powered sub directly to the amp or use a powered sub with a speaker-level input (or buy a separate level attenuator instead). BTW what is the difference between the EF-1080i and 1080d? I have the 1080d and basing it on what I have seen it looks like the sub wires are the white and purple ones? You have any precise info on these? Also I am looking on the old school low powered Pioneer TS-WX50 which is a spare tire subwoofer, it comes with a remote bass control (will this be worth my effort). Should I even bother tweaking the amps’s sub range with this kind? Sorry for all these questions I am new to this. Kids have to go to college first so it took me time to play lol. Can please you clarify this inconsistent info I am seeing on the linked “PDF manual regarding the (J801)14 pin connector schematic? On page 18 it shows that connections 10-ACC and 11- GND while on page 19 connections 10-N.C. , 11-ACC and 12-GND. From what I am looking at the harness, page 18 makes more sense as the harness wire on connection 11 is black and slightly different is diameter size than the rest of the wires also the wires on connection 12 is twisted with 4 (labelled N.C). Am I right to follow the one on page 18? Also what does B/U on connection 6 means? Would this be the 12v continuous (main power supply) connection? I know the ACC is for the ignition switch. Now the illumination on this unit has a (+) and (-) connections, while my Miata has only one (+) illumination wire, is it okay to leave the (-) wire? As for the EF-1080d amp, can I connect the power line to head unit 12v continuous wire or should I hook-up straight to the battery with a 20A fuse since the head unit controls the on/off remote switch for the amp anyways? Thanks again for your patience. BTW is there a better way to contact you? Sorry for plaguing you with so many questions. But can I run an aftermarket amp using the OEM 13 pin din, utilizing the concept you posted for the EF-1080? No problem! 🙂 Yes that will work fine – that’s exactly what I do when testing these head units on the bench. Did you use a line output inverter? Not with the McIntosh head unit as it doesn’t have a power amp in it; the 13pin DIN is line level. I recently acquired a the older PF-2343I-A CD Tape deck and was wondering if the remote voltage out from the HU was enough to power on my aftermarket amp or if I would need a booster. 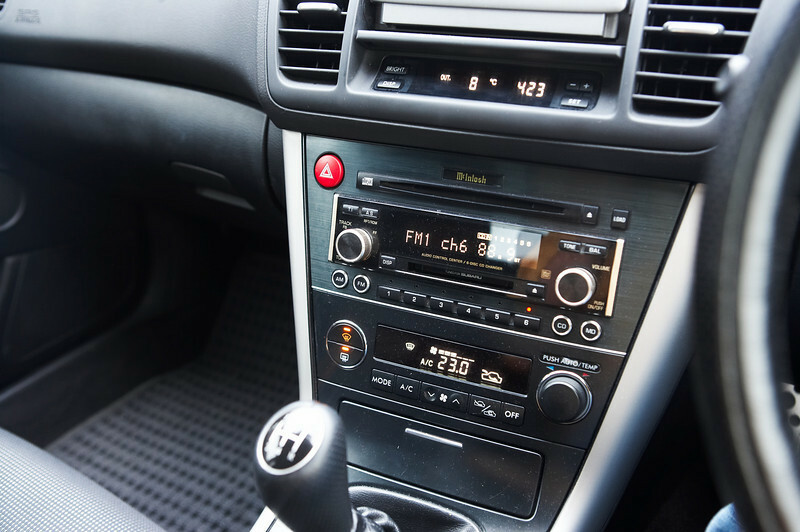 You can connect the head unit directly into the preamp inputs of any amplifier and it will work fine. Alright, do you know if I would be able to integrate factory steering wheel controls with that model. Or is that just not a possibility. Not practical on the old tape units unfortunately as they don’t have any input designed for this. I found this great thread, and have a question. 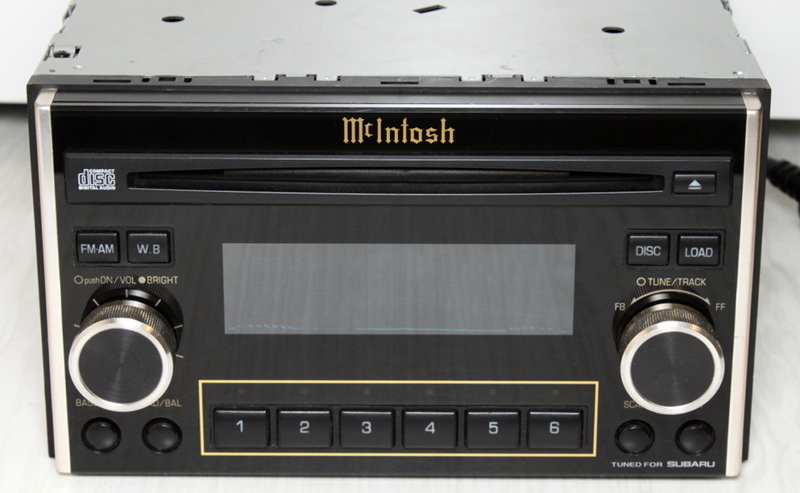 I have a 2003 VDC Outback Wagon with the McIntosh head unit featured in this thread (USDM). All winter long (in USA, New Jersey), the CD player is very sensitive to bumps in the road. The CD player will start to skip, and then re-read the CD repeatedly, until (I assume) the buffer is filled, then it plays until I hit another minor bump, and the whole process starts again. The problem goes away after about 15 minutes of drive time, less if I am on a smooth road, longer if I am on a bumpy road. When the temperature stays above about 45 degree fahrenheit, the problem goes away entirely. I want to keep this unit, but this issue is driving me nuts. I have tried several CD-lens cleaners without improvement. Any suggestions for me? I’ve seen a few causes of this. 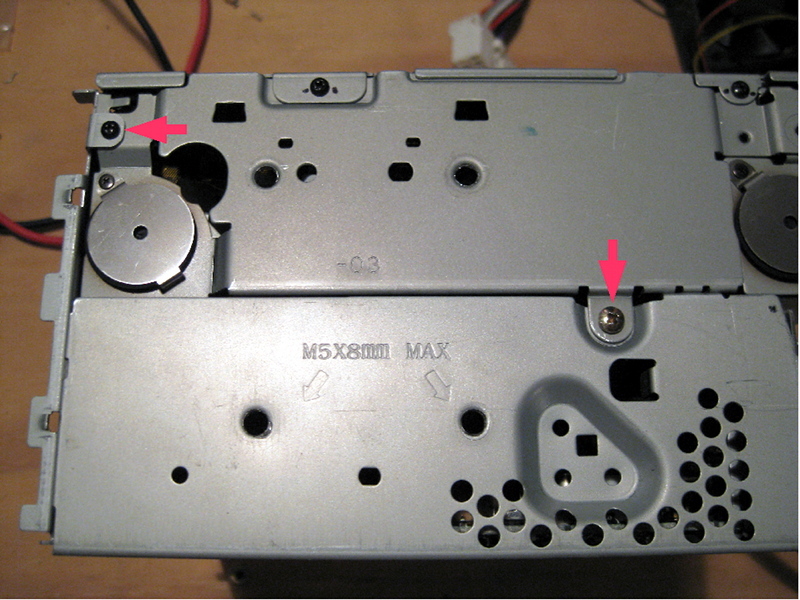 It’s most likely the spindle motor; check that it rotates freely and that the black spindle that the disc sits on is not rubbing against the motor mount screws. Alternatively it could be the laser pickup. FWIW I once replaced the entire spindle motor and laser assembly on one of these units for around US$40 from Pac Parts (part number HBS590100). It’s about half an hour’s worth of worth and not too difficult if you have worked on electronics before. Thanks, nzlamb! Since I posted my question, I was able to get a used OEM head unit replacement pretty cheap and swap it out for the problem unit. Of course, I won’t know until next winter if the replacement unit has the same issue or not. If it does, I will try to find someone to replace the spindle motor and laser assembly with the Pac Parts item you gave me in your post (I do not have any experience in electronics repair, but I know a few people who do). First of all these blogs of yours are fantastic and interesting. Probably going to try and do the fm mod to a PF4062I soon. You’ve not got a guide on it but you mentioned up the page you had found the service manual? would you be able to point me in its direction as so far ive had no luck finding it. There are two in this model. Sorry I don’t have one on me to use as an example. I’ll see if I can find some photos. Thanks mate for taking the time to come back to me. Your posts have been invaluable. We got it going In the end identified the coils and made new ones tuned using a sig Gen. Works great asides the horizontally polarized aerial in a valley. Any suggestions for the aerial? Mine built into the rear glass. I’ve also noted that the display brightness on the radio is very dim. Turning the lights on makes it even dimmer as it should. The brightness appears to be directly related to the radio input voltage. At 14volts it was reasonably bright. At 11.5volts. Almost so dim it can’t be seen. It’s an led backlight? Any thoughts? Was thinking of making a more directpower feed to the backlight somehow. I am trying to power two different models a PF2343I and a PF2142I but both are not turning on. My understanding is that it needs 12volts between pins 10 and 11. Is this correct ? Hi, I am trying to power up a PF-2343I but its not turning on. Do I supply 12volt between pins 10 and 11 or does the B/U need connecting as well? I can’t answer you, but you can contact McIntosh Labs in Binghampton, NY. Believe it or not, a few years back someone there (Chuck Hinson?) sent me a scanned diagram of the pin connector with all the pins labeled. This was at least 10 years after the model was discontinued. It appears that the 25201-a (which I have) includes a Clarion cenet adaptor receptacle. Does this mean it will work with some of the Clarion-compatible USB or AUX jack adaptors on the market like the Yatour? I recently purchased the McIntosh tape/CD player from a subaru. I would like to connect it to my 2002 Infiniti g20 which has a bose factory amp. I bought the aftermarket plug. I get power and all functions work. I get no sound/volume. I use a pac oem1nissan factory sound interface to aftermarket radio. All wired correctly. Any ideas would be greatly appreciated. Thanks. I replaced the McIntosh PF-23431-A in my daughter’s 2002 Subaru Outback VDC this week. I have the PF-23431-A if anyone wants to buy it. We’ve had the car for a couple years. The car and stereo are both in good shape, especially for their age. The stereo is functional although we never tried the cassette player. I replaced it with a new Kenwood to gain Bluetooth, hands-free calling, USB charging port, and all the modern features that teenagers want. I’m in Colorado and can pack it well and ship it anywhere. If interested, make an offer. I can provide pictures. I replaced the McIntosh PF-23431-A in my teenager’s 2002 Subaru Outback VDC. I’m willing to sell the McIntosh. It’s functional and in good shape for it’s age. I only replaced it as the kid’s wanted a modern stereo with Bluetooth, hands free calling, USB charging port, etc. Contact me with an offer if interested. I can provide more information and pictures. Not myself, but another comment this week someone is keen on buying one. Do you mind if I send them your email address? I’ve been toying with this unit for a while. During my recent tests I found that using the Phone input, activated by the rear connector, I have no output to the rear speakers. If I switch back to the radio with a similar test tone, the signal appears again. I’ll probably try it like that, since I’ve already modded the unit quite a lot, but I guess that’s purely a software quirk. Have any of you guys noticed the same? I hadn’t noticed that (I’ve only used that mode on the workbench with a single pair of speakers) but it doesn’t surprise me. I’d say it’s a deliberate design decision; the phone mode already disables the tone controls and I guess the engineers decided that rear seat passengers weren’t particularly interested in listening to a phone conversation. Yup. That is my guess too. I’ll try that way and if I dislike the sound I’ll bypass the FM input to the LC75412. Everything is possible when you want it to!